Hello and welcome. I am semi-retired, now doing legal transcription from home. I just realized that I have not taken the time to update this page. We are now living in beautiful North Georgia as of December 2015. 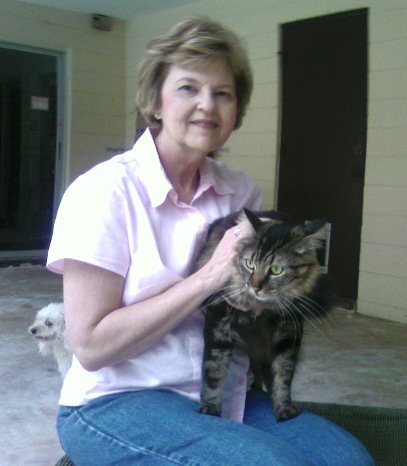 I used to live in [usually] sunny Florida with my husband of 28 years, our Poodle named Pippin (in the background), and seven cats, Midge, Nicky (pictured), Freckles, Charlie, Inky, Maggie and Tippi (all rescues). And I wouldn’t have it any other way! I actually became interested in researching my genealogy back in the 70’s. At that time, it was only an interest. I dabbled. Oh, if only I had been bitten with the “bug” and pursued my genealogy with all my might while those relatives who held information in their heads could have shared. I gleaned some information from them at that time but not nearly enough. I was young and Life and all it had to offer occupied most of my days. I became interested again in the late 90’s, especially after being introduced to the Internet. I gathered a lot more information on my family history by way of the Internet. I even located relatives I didn’t know existed. But even that effort was relatively short-lived as the cares of the day-to-day survival took over. But now, oh, now, I actually have the time and the inclination to search, research and write! It’s too bad all my relatives who held the most information have moved on to greater things. The blood of my ancestors courses through my veins. They are as much a part of me as life itself. Were it not for them and the choices they made, I wouldn’t even be here! By learning about them, I hope to learn more about me. I want to share the stories of their lives and in the process share bits and pieces of my life and, in the process of sharing, if I can impart any of my knowledge or wisdom regarding life in general and in genealogy which helps or inspires anyone, then my efforts are not in vain. This blog, which began with the aspirations of being all about my family history, has evolved into a more eclectic blog. I say eclectic but, in reality, it has become more of an iPhone photography blog where I participate in various challenges and post some of my pictures. I do still, from time to time, just write and post about completely unrelated things. All in all, I do hope that your visit here will be pleasant and uplifting for you and that you find something to your liking! I appreciate your time and comments! I just posted a message to you under your wonderful Jeremiah and Elizabeth Burns Blog.They are my 4th great grandparents. I also enjoyed John Burns Hatcher…well actually I read all of them and was very impressed. Just wondering if you would like to share family trees? Are you on Ancestry.com? I was able to fill in some of “our” part of the family tree that we share today with the url you gave me. THX so much for that info. I’ve been at it all day. So we are 4th cousins. This is so much fun. The reason it took me so long today is that I kept getting sidetracked on your wonderful stories on your blog. Some of them read several times. You are a wonderful writer/journalist. I have a lot of stories and info to catch up on. Just thought you might be interested to know that we lived in Central Florida, De Leon Springs, for 20 years and then moved back out west to New Mexico and have been here for 14 years now. My hubby and I were both born in Oregon, raised in southern California and met each other in the Bay area. We have lived in many fun places and expect we will stay put now. Thank you, Adam, for your visit and kind words. I’ve also started reading your blog and find it most interesting! I’m looking forward to reading more. All the best to you! Thank you for stopping by my page and liking my pet pictures. Having read your “About” I realize we are both pet lovers. our household has several dogs….and one of them happens to be named Freckles!! Welcome! Another Freckles? Fabulous! 😀 I’m looking forward to following your blog, too! Thanks for dropping by! It is interesting what you are doing with genealogy. A great big welcome to you, John! It’s always great to connect to family! 🙂 I appreciate your kind remarks about my post. I would be most happy to share what I have. It will be interesting because I have five boys and four girls (no twins) from Elizabeth Rowland! I’ll try sending you an email. Hi Linda, I am not sure we have had a chance to chat. I have part Elizabeth Rowland’s tomb stone. The grave yard was razed in the 1960 and my father and I were only to recover part of the broken stone. The first Elizabeth is buried beside Jeremiah on Bear Creek, Boyd County Kentucky. He was married twice and the children I was referring to was of the “First” wife and that is where the twins were born. What a great family history we have. Linda, thanks for stopping by my blog. I see you have 7 cats! We have five. When I met my wife, she had four cats at the time and pretty much told me love me, love my cats. And I did! Will be checking out your blog. Welcome, John! Someone once told me that cats were easier than dogs to care for. I’m thinking those people never had cats! We’ve got our hands full but we love them dearly! LOL! Thanks much, Anne! Although I think the only thing about me that might sound like you might be my start in genealogy! Otherwise, you are way more adventurous than I have been in my retirement! 😆 Don’t be a stranger! I’m enjoying your blog! Lovely website. Look forward to following. Hi Linda, I like the new look and focus of your blog. I’m looking forward to catching up. Happy belated New Year to you! Hi, Linda. Can I have your email, please? There’re things I’d like to ask regarding your husband’s health as I prostate cancer survivor. Thank you. This looks like a great blog to follow. I look forward to it! Looking forward to reading your posts. I’ll gain more insight concerning ancestry. I attempted research some but it gets pretty confusing at times. This may sound weird but I’m somewhat intrigued with dropping by cemeteries when I travel to areas where I think some of my relatives may have lived to see if there names are on the grave markers. Great work! Thanks, Ron! I appreciate your visit and comment. Researching our family history can definitely become an addiction! And, yes, it can get very confusing at times! LOL! But don’t give up. Every little break through is an inspiration. Visiting cemeteries is definitely not weird! It’s all part of discovering our heritage! I’m looking forward to reading your posts! All the best! Hi Linda! Thanks for liking one of my posts! This is my first time visiting your blog. You certainly have a lot of followers. 🙂 I LOVE working on genealogy too!!!!!! I am in Oregon now and soon I intend to get back into my ancestor research. Great to see you online! I’m ashamed to say that it’s been too long since I’ve worked on my genealogy. I actually started my blog to post mostly about genealogy and ancestors. Got started and realized I didn’t have enough personal info to make it really interesting (in my opinion). So, I expanded the blog. But I, too, plan on getting back into it again. I know how addicting it is! LOL! …and you have a very handsome cat. Thanks for thinking of me, Isadora! I’ll check it out. Looks like fun!